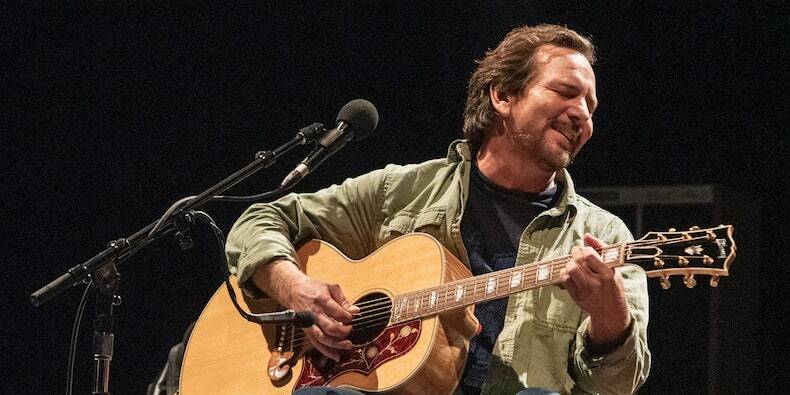 Watch Eddie Vedder Cover A Star Is Born's "Maybe It's Time"
Last night time (March 3), Pearl Jam frontman Eddie Vedder carried out at Innings Festival in Tempe, Arizona. During his set, he coated “Maybe It’s Time,” a track written by Jason Isbell and carried out by Bradley Cooper for A Star Is Born. Watch under (through Stereogum). Scroll down to listen to Cooper’s soundtrack model. Bradley Cooper and Lady Gaga recently performed A Star Is Born’s “Shallow” on the 2019 Academy Awards. “Shallow” additionally gained the 2019 Oscar for Best Original Song. Previously, “Shallow” earned Best Pop Duo/Group Performance and Best Song Written for Visual Media on the 2019 Grammy Awards. Read “Why ‘Shallow’ Is Destined to Be a Karaoke Classic” on the Pitch.